It was a snowy and cold day today, so for dinner today: I made spicy chicken tenders. Easy, delicious, warm and comforting! 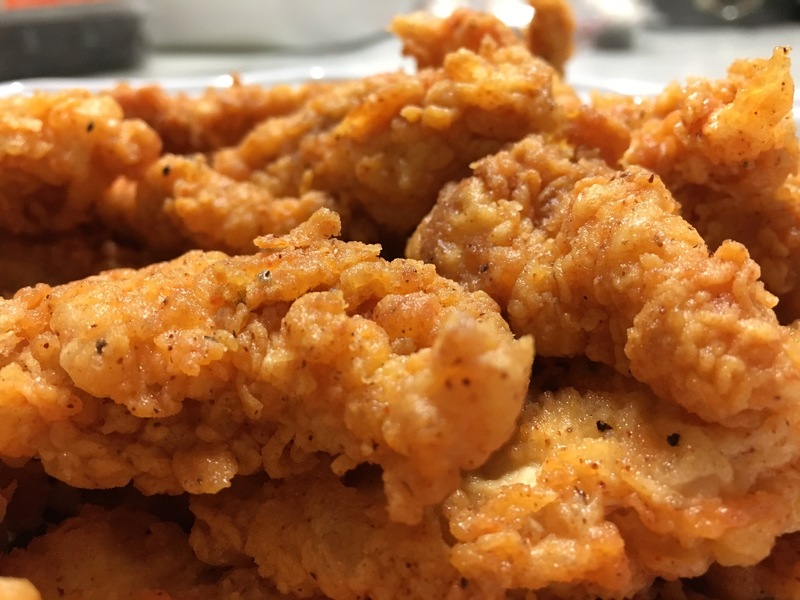 They are kid friendly, but let’s be honest — who doesn’t like chicken tenders when they look and taste something like this?? My standard seasoning mix: salt, black pepper, cayenne pepper, paprika, and garlic powder. I h ad several large pieces of thinned boneless chicken breast, so what I did was I cut them all to a chicken tender size. Long and thin pieces of meat. To your chicken, add your seasonings – salt, black pepper, paprika, cayenne pepper and garlic powder. Add in milk and eggs before adding in about one cup of hot sauce. I used this amount and you could taste the heat, but it was very tamed — so adjust based on your liking. You can use whichever hot sauce you like of course, I just prefer this one. It’s also the one I use to make my boneless chicken wings. 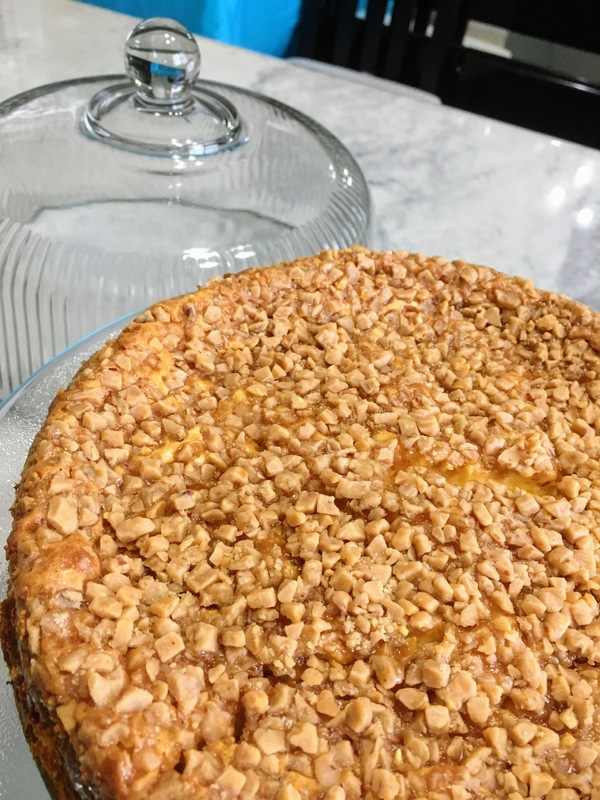 Have you checked out my recipe for that? In a ziploc bag [for easy clean up], add your flour. To your flour, add in the same seasonings as above – salt, black pepper, paprika, cayenne pepper and garlic powder. Shake well to combine. In batches, transfer your chicken batter into the ziploc bag with the seasoned flour. Shake well to combine. 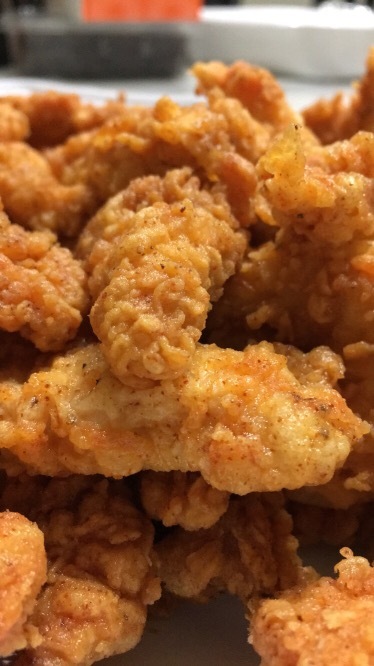 Fry your tenders, in batches, until they are golden brown. Tip: I get asked a lot how I get the crispy and crunchy on the end product so perfectly, and my guess would be ziploc should get the credit for it… that technique coats really well — whether it be chicken, seafood, or whatever you are working with. I have a few variations on french fries, that would work perfect with these chicken tenders, that you can find my clicking here and scrolling down close to the bottom under Side Dishes! My brothers and I hosted a Superbowl party, yesterday, for some of our cousins. For dessert? 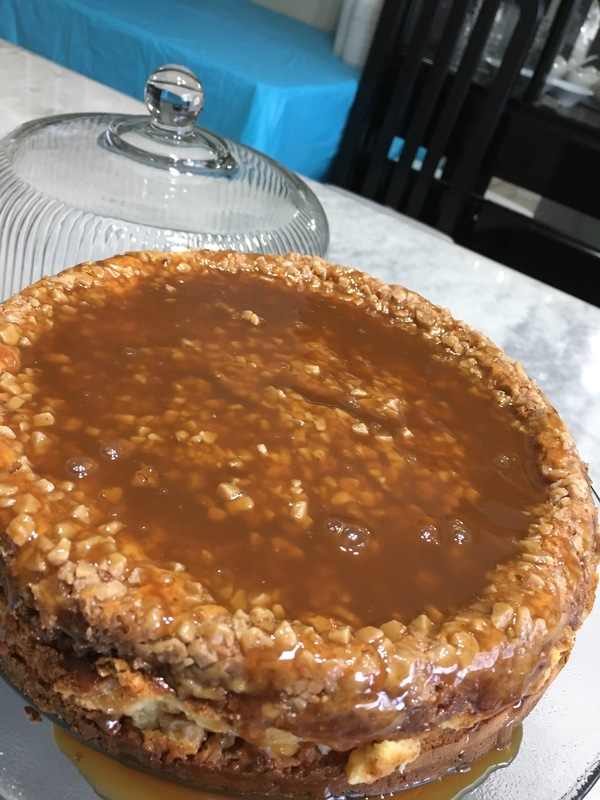 I made another variation of a cheesecake: this time, I made a Toffee Cheesecake. If there is any doubt I love cheesecakes, check the different variations I have made and posted the recipes of on here. Combine the butter and graham crackers. Press the mixture into the bottom [and across the lower sides if you would like] of your springform pan to form the crust. Next, in a large bowl, beat your cream cheese until it is smooth. Add in the condensed milk and beat the mixture well [until it is evenly incorporated]. Next, add in the eggs and vanilla extract. Do not over beat the mixture, just enough until your mixture is smooth. Coat your toffee bits with the tablespoon of flour. Why you ask? Read my tip down below why I do this. Fold in about one cup of the toffee bits into the cheesecake batter. Pour your cheesecake batter over your graham cracker based crust. Sprinkle the top with the remaining toffee bits. 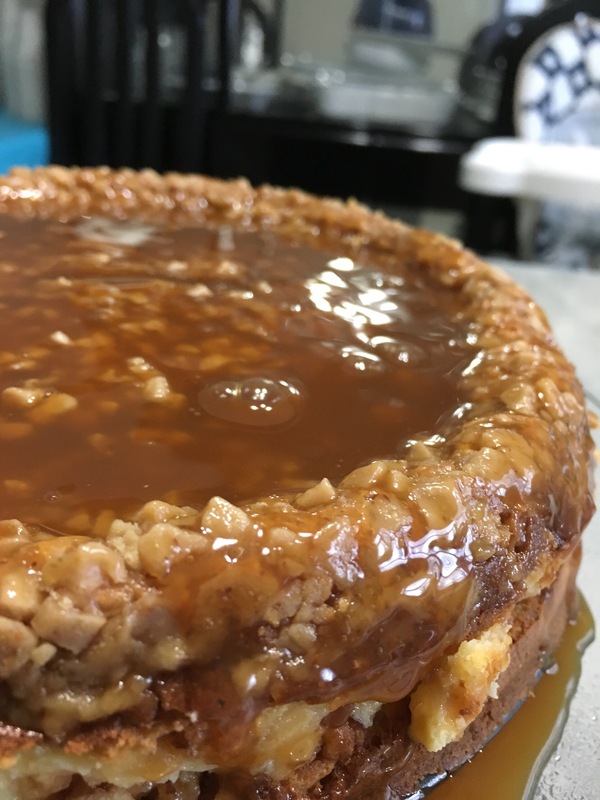 Let the cheesecake cool, and then either put the Ca ramel on top like I did… or drizzle on each individual piece as serving. Tip: In order to make sure the toffee doesn’t sink to the bottom, coat your toffee with a little bit of All-Purpose flour. Trust me, newbie me had chocolate chips sink to the bottom once… but I turned it into a positive thing by having an extra layer of chocolate… who doesn’t like chocolate!